My son is a chicken nuggets lover. Admittedly, so am I. 😉 There’s something so nostalgic about dunking a crisp and juicy chicken nugget into buttermilk ranch, or good ‘ol fashioned ketchup. There is, however nothing great about store-bought nuggets. When a box says “made with real chicken breast meat.” Does that mean some are made with fake chicken breast meat? And what else exactly goes into those nuggets? All of those scientific sounding ingredients must be ok since they’re all approved by the FDA, right? Hmmm… I can tell you exactly what’s in these babies and why I feel good giving them to my babies. I’ve been working on developing a homemade version of chicken nuggets for some time. I’ve tested countless recipes and, ladies and gents, we have arrived! These are beautifully golden without having to pre-bake the crumbs. They are low fat, tender and juicy. 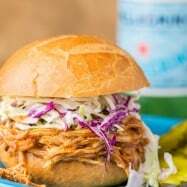 Did I mention they are real easy to make and you don’t need a meat grinder? 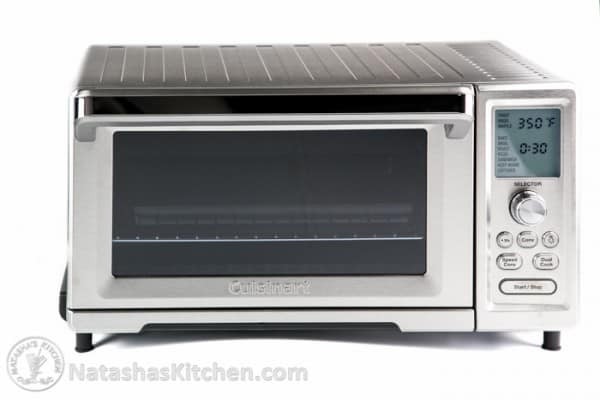 Read on to enter the great giveaway from Cuisinart! 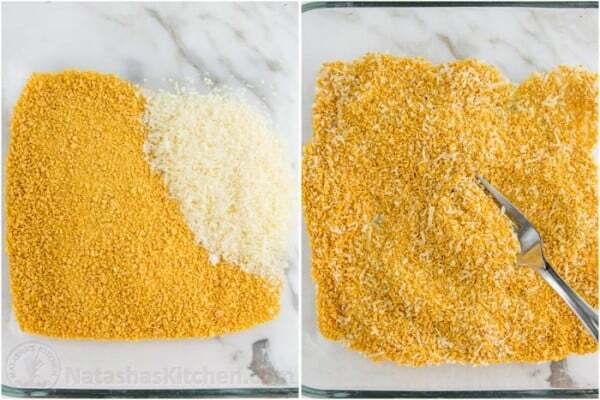 *Note: You can use 3/4 cup panko crumbs instead of corn flakes. 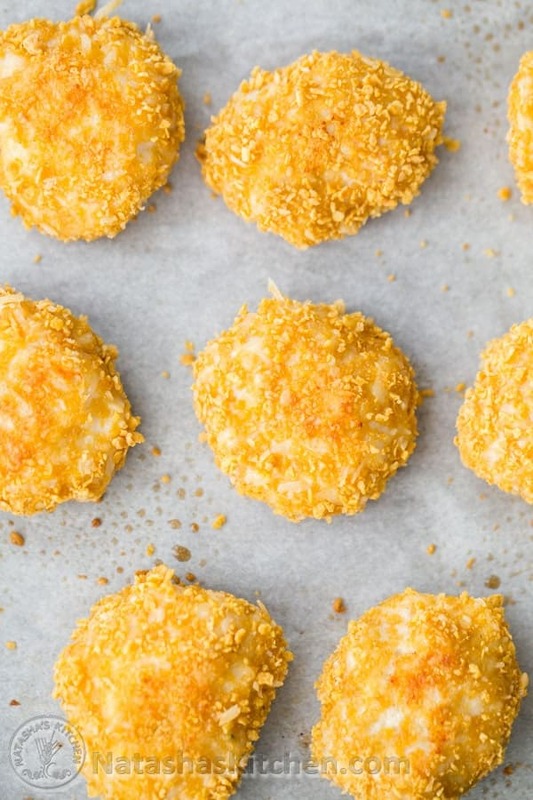 To get the panko crumbs golden, spray nuggets with cooking spray before baking and bake for 13 min then broil nuggets additional 2 minutes to give them a golden glow. 2. In the bowl of your clean food processor, combine 1 lb chicken pieces, 1 Tbsp potato flakes, 1/3 cup water, 1 tsp garlic salt, and 1/8 tsp black pepper. Pulse until chicken is finely chopped. P.S. if you don’t have a food processor, by all means, use a meat grinder with the small grinding disk. 3. 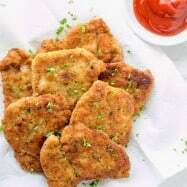 With wet hands, roll and flatten chicken into small nugget patties (using about 1 Tbsp of the meat mixture for each nugget). Roll the nugget into bread crumbs, pressing gently for crumbs to adhere. Freezing Tip: You can freeze them once they are breaded; freeze them flat for 1 hour, then transfer to ziploc bags and store up to 3 months. When ready to bake them, bake frozen nuggets as directed in the next steps. 4. 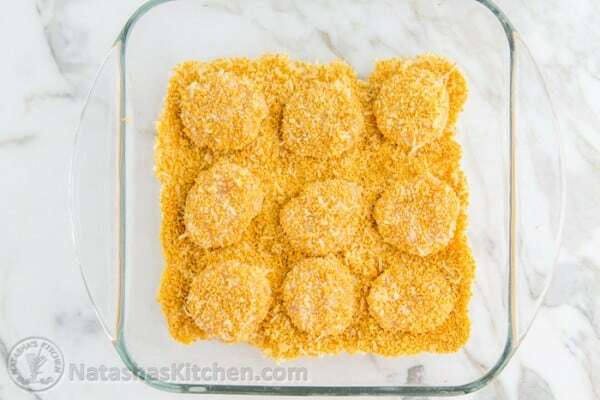 Transfer nuggets to lined baking sheet and bake at 375˚F for 15 min on the middle rack or just until cooked through, flipping them over half way through baking. Remove from oven and let nuggets rest a few minutes before serving. P.S. Don’t over-bake your nuggets or they will start to get dry. 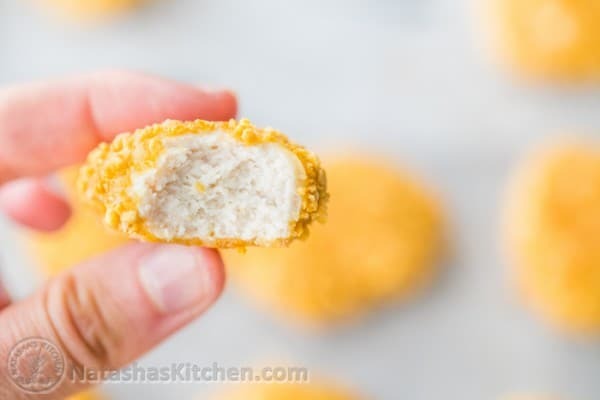 How to Make Chicken Nuggets: Preheat oven to 375˚F. Line a baking sheet with parchment paper. Pulse 2 1/2 cups corn flakes in a food processor until fine crumbs form (or take a rolling pin to them in a large zip-loc bag). In a shallow bowl, stir together 3/4 cup crumbs and 1/4 cup finely grated parmesan. 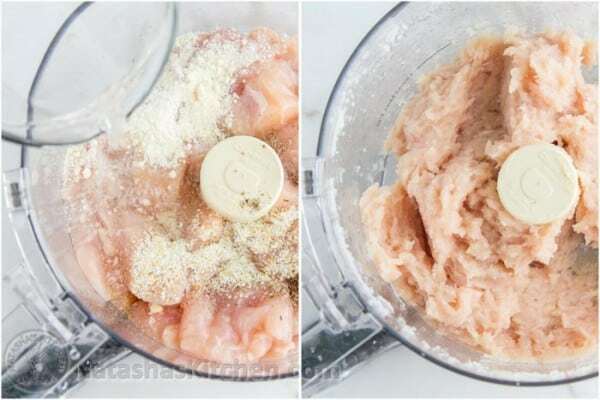 In the bowl of your clean food processor, combine 1 lb chicken pieces, 1 Tbsp potato flakes, 1/3 cup water, 1 tsp garlic salt, and 1/8 tsp black pepper. Pulse until chicken is finely chopped. P.S. if you don't have a food processor, by all means, use a meat grinder with the small grinding disk. With wet hands, roll and flatten chicken into small nugget patties, using about 1 Tbsp of the meat mixture for each nugget. Roll the nugget into bread crumbs, pressing gently for crumbs to adhere. (Freezing Tip: You can freeze them once they are breaded; freeze them flat for 1 hour, then transfer to ziploc bags and store up to 3 months. When ready to bake them, bake frozen nuggets as directed in step 4). Transfer nuggets to lined baking sheet and bake at 375˚F for 15 min on the middle rack or just until cooked through, flipping them over half way through baking. 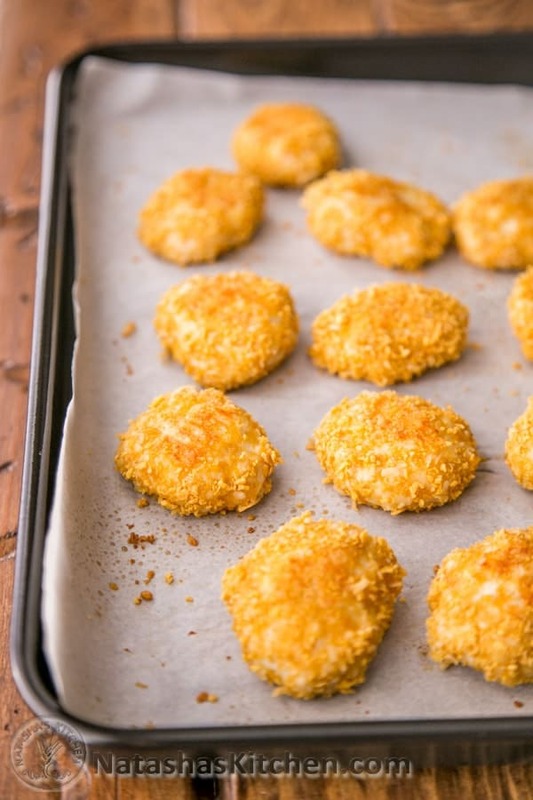 Remove from oven and let nuggets rest a few minutes before serving. P.S. Don't over-bake your nuggets or they will start to get dry. 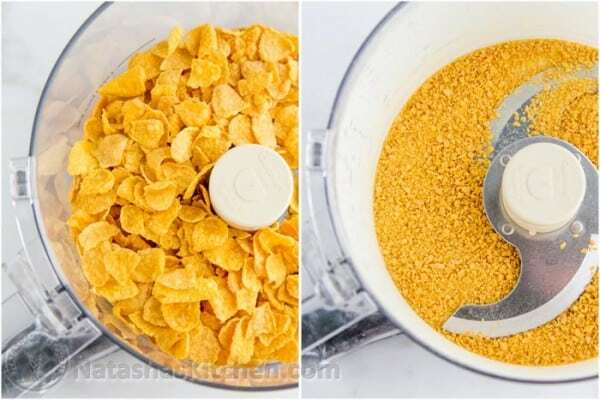 *You can use 3/4 cup panko crumbs instead of corn flakes. 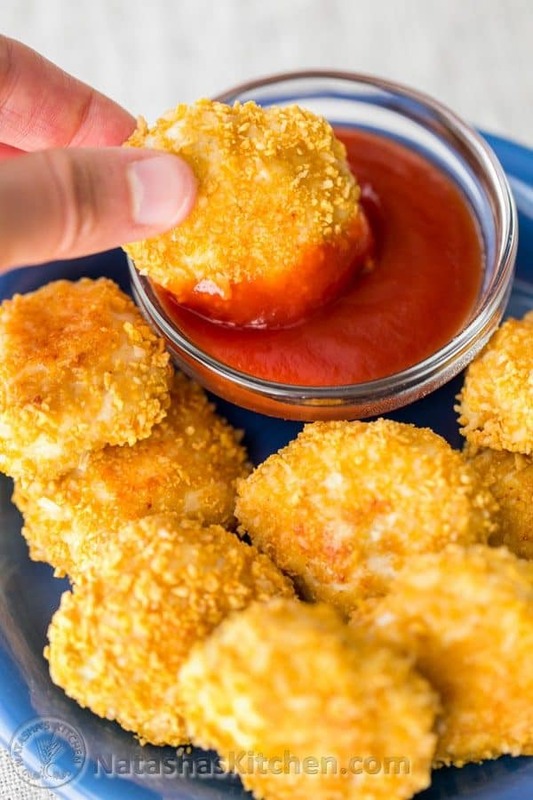 To get the panko crumbs golden, spray nuggets with cooking spray before baking and bake for 13 min then broil nuggets additional 2 minutes to give them a golden glow. 1. It will cut down your bills – it pre-heats super quick. 2. Less micro “waves” going through your food. 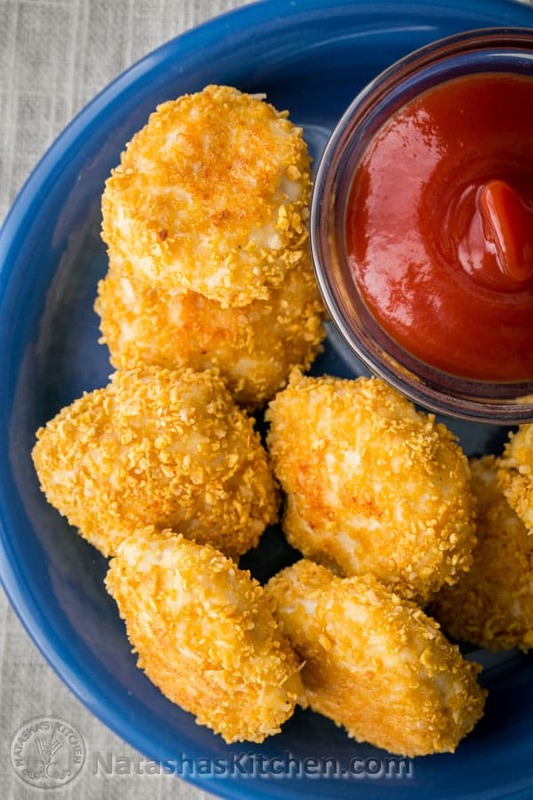 Do chicken nuggets taste off to you after they’ve been through a microwave? I’m convinced it does something weird to them. I’m also really skeptical about standing next to the microwave while it’s on. Call me weird, but I don’t like to be next to it. I don’t have to feel awkward next to this Cuisinart. We are tight. I can stare right into the window to see how my nuggets are doing. 3. Two words: Even. Cooking. Microwaves seem to stink in this arena and sometimes the plate gets ultra hot, while the food is still cold in the center? I conclude that a microwave cannot be trusted to cook food. 4. It’s great to have a back-up for when you need to bake multiple items for a party and your primary oven is doing the heavy lifting. 5. P.S. it comes with a pizza stone – that’s right, it’s great for pizza too! To thank Cuisinart for generously sponsoring this giveaway, be sure to show them some Like on Facebook, Instagram, and Twitter. To Enter, please use the Rafflecopter widget below. If it doesn’t load right away, give it a sec or refresh the page. Thanks friends! 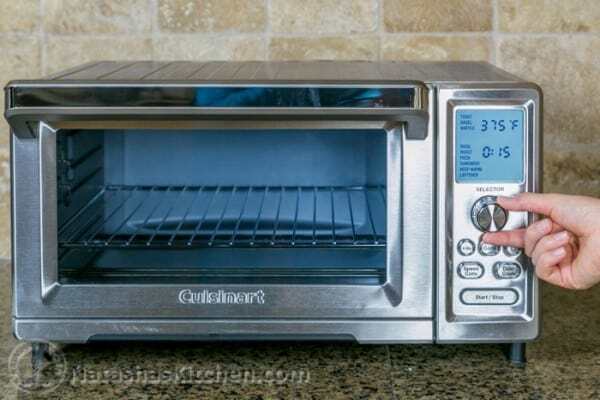 Disclosure-this giveaway is provided by Cuisinart, however all opinions are my own. Thank you for supporting the brands that continue to make Natasha’s Kitchen possible. What would the nutritional info be for these chicken nuggets? I’m on a low sodium diet, but boy does my family miss nuggets!! Hi Natasha, can you replace with something else potato flakes? And chicken tenderloin instead of chicken breast? Oh, we have Kroger here, I’ll check there, thank you. These are insanely good – made even better by the fact that they do not tote an ingredient list that adds up to a paragraph 30 lines long!! 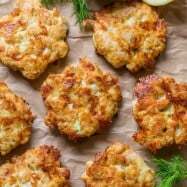 My daughter, aged 15, still loves chicken nuggets, but due to family food sensitivities, I have been looking for better ways to feed her – as in less chemicals & more nutrition. Hi!!! 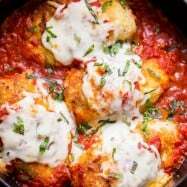 Im having hard time finding potato flakes where I live, not sure if can find the potato flour as well, can I subtitute it? If yes.. With what? Just made them and they are awesome. I did not have all the ingredients so replaced the cornflakes with the regular breadcrumbs, potato flakes with potato flour and added one egg in place of water. They came out wonderfully. I also put a tiny piece of butter on the top of each of the nuggets before baking. They were really moist. I ate them with marinara sauce- awesome! I was wondering – instead of processing the chicken raw, could I boil it & then process with the water & Potato Flakes? I love your recipes! 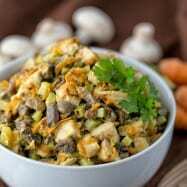 Was wondering if I’m short on time, could I use ground chicken and skip the step with the potato flakes? Or would that change the flavor too much? Hi Natasha, could I just cut the pieces of chicken (cube) other than mincing them? Thank you! this is just the chicken nugget recipe i was looking for! I was too excited and forgot to add Parmesan cheese. But it’s not a big deal :). My kids love it and also my kid’s friend. I don’t have potato flakes, so i used 1 steamed potato and no water. We tried this today (using breadcrumbs instead of potato flakes and corn chips instead of corn cereal), and it was delicious! The nuggets were cooked in a pan in a little oil, as our oven heats up the house too much, and they were still amazing. 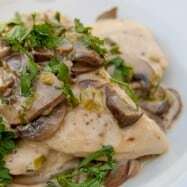 As someone with chronic nausea, it’s so helpful to find an easy-to-eat source of protein, especially one that tastes so good. Tried this last night…Mine came out flat? Will try to make them again. 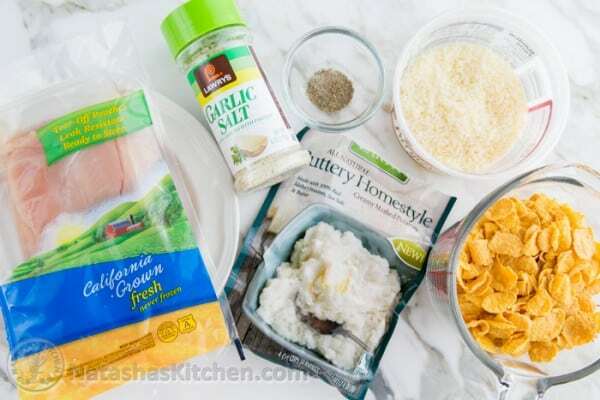 can i substitute potato flakes with something else? It’s only my wife and I now. This oven would be perfect for us. It would make it easier then lighting up the oven every time we want to bake a small 2 person meal.